Boomer is a brindle boy that raced at 72lbs. His sire is TNT Star Wars and his dam is Speedy Petal. He only raced 18 races at Southland in Arkansas and broke his hock October 3 of 2013, back when he was only 2. The break was splinted there by a vet and he was sent to us for rehab. Our vets also checked his leg and agreed that he would heal up fine in a splint and the break wouldn't require surgery. Boomer's break healed up nicely and he was adopted in December of 2013. He was returned to us for rehoming in 2017 because of financial problems, that made a move in with relatives necessary. Boomer was adopted quickly then and has been in a home for over a year. Boomer has just been returned again because his mom's health is failing. She is no longer able to care for him. This sweet boy has just had some bad luck over the years. Boomer likes to go on short walks and is great on leash. He can run around and do whatever he feels like doing, but probably wouldn't enjoy long hikes or jogs due to the old injury. He does favor the leg sometimes. Boomer turned 7 on August 11th. He is a sweet, very calm boy that is very good and already home acclimated. He is a little timid at first and a bit overwhelmed but warms up. He is very lazy and is happy to just have a soft dog bed to lay on. He isn't a dog that follows you or bothers you for attention. Boomer potties nicely on leash so may not need a fenced yard. 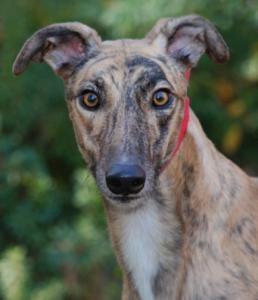 He is a gorgeous, brindle boy with the prettiest eyes. Boomer has lived with cats and small dogs in his first home. When Boomer was first with us he loved his crate and was very quiet in it while he was on crate rest for the broken leg. He was so quiet in his crate we felt he may be a great apartment dog. He would probably not be able to do a lot of stairs due to his old injury and would at least need an apartment on the ground floor. He would be perfect for someone that didn't have much time or energy for walking and exercising dogs. His former owner says he loves kids and she is hoping that he gets a home with a child. The pictures are from when he first arrived and was younger. Boomer passed away in February of 2019 after developing Bone cancer. He was only in his final home a few months after his return. He will be missed.